While I was pregnant with my first child, my heavenly Father impressed on my heart that each of my children were to be taught music. I knew this thought must have been from Him, because I hated the piano. If I never touched a piano for as long as I lived, I would be perfectly happy. I was forced to play the piano for 10 years and hated every minute of it. Actually… I can only remember hating it, but I certainly must have liked it when I started. So how could I possibly subject my kids to the same horror that I experienced? Well only by the grace of God, of course! My oldest child, the composer, was my first reluctant piano player. I started him in lessons at 5 years old. The lessons were always very difficult for him, because of his learning challenges, but he played with such emotion and sensitivity, that I knew through diligence and perseverance he could be great. With him, it was helpful to remember that giving up was not an option and by the time he was 14, he finally started to like it. At 13 I told him he could choose another instrument to play, but he stuck with the piano. 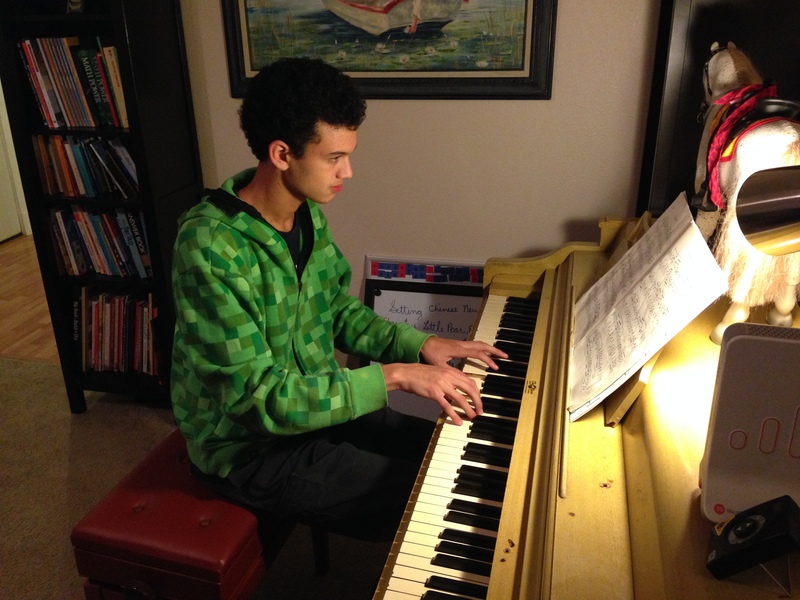 He is 17 now, practices at least 2 hours a day and spends the majority of his free time composing. He also plays the keyboard with our church worship band and leads the youth worship band. At one point he came to me and wanted to quit his classical training in order to just focus on composing. I explained to him that the classical training is what makes composing and playing with the worship band so easy. The classical training is his exercise in the same way that barre work is necessary for every ballerina. No ballerina likes to do those boring barre exercises, but they do it for the glory of being on that stage. Don’t ask me why I would use a ballerina example with a 15 year old boy, but it was all I could think of, and thankfully, it worked. Ok… so kid number one…check! My second child is a musical prodigy. He came out of my womb drumming. He has the focus and drive to practice, although, even he, at times, gets discouraged. A little encouragement, though, is all he needs to get off and running again. He is taking drum and guitar lessons. Guitar is more of a challenge for him, and it takes a little extra coaxing to get him motivated, but he sees the big picture and is motivated to be a rock star. My third child, the ballerina, has been the biggest challenge yet. She is a gifted little musician, but absolutely lacks drive and motivation, and simply doesn’t want to do it. I started her in lessons at 4. Her teacher saw her potential and advanced her quickly. She was fine and compliant until she was about 6, when it became a crying miserable mess every time she sat at the piano to practice. I decided that the problem was due to the fact that she was advancing too quickly. I discussed this with her teacher, but he just said that she was doing fine. He, however, was not at our house everyday for the practice session meltdowns. So at this point I needed to re-evaluate the reason I was making her take lessons and play the piano in the first place. It wasn’t important to me that she was able to play with perfect classical technique, nor was it important that she was able to memorize 15 pieces by June. What was important was that she learned how to read music so that if the Lord ever impresses upon her heart to play for Him, she may be able to do so. Considering also her love for dance, I knew that playing an instrument and understanding music would only aid in her ability to dance. She may not understand that yet, but she will thank me one day. So I decided to take my ballerina out of piano lessons. I picked out a Disney music book and a Contemporary Christian worship music book and had her choose one song from each. 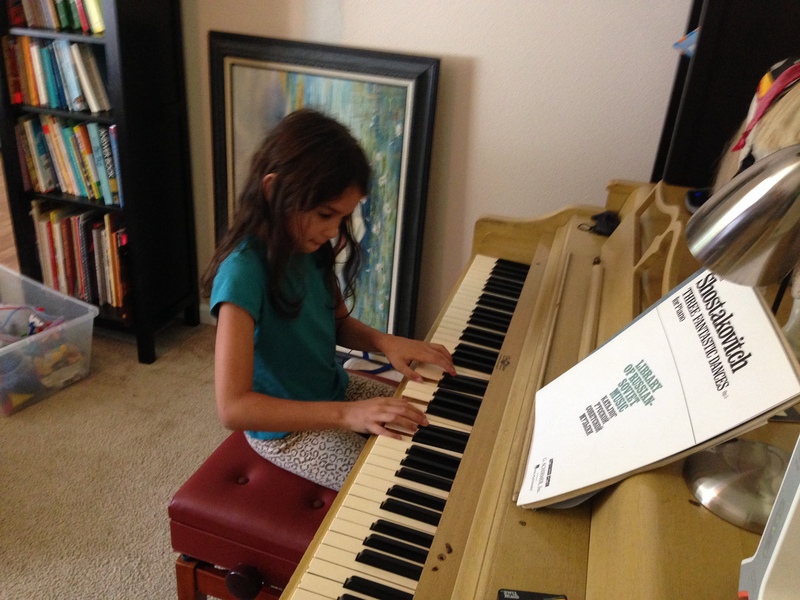 We took it slow and she began to learn each piece at her own pace. No rushing, she had no deadline to meet; I just wanted her to gain the discipline of practice. Anyway, practicing these pieces, which she chose, went well for a while. But then, she either got bored, or it got too hard, because the crying and pleading struck again. I could no longer take it, so I resorted to having her just play the scales for a while. I was determined that she was going to at least sit at the piano every day. At this point, I really didn’t care what she did there, but my will was going to win. Really, I did want her to enjoy it though, so I prayed hard and waited for an answer. While waiting for His answer, I noticed that she was content sitting at the piano and playing her scales. This interested me and made me think that the pieces she was playing were really just too long. She liked it to be short, simple and sweet. It’s like a child who you know can read the chapter book, but when left to his own choosing, picks up the picture book to enjoy instead. Then one day, when picking up the composer from his lessons, I asked my ballerina to look at the music books in the store to see if there was anything she wanted to get. She found the answer to our prayer. The books are called Treasures in Technique and what attracted her were the stickers inside. For every achievement, she gets a sticker to place on the pirate map. The exercises are short and sweet and she now willingly practices everyday. We haven’t had a tear since we bought the book. Granted, I did by the book that was a step below her actual level, but since we don’t have to keep up with anyone else, who cares!! She likes that she can do it all by herself, because it satisfies her need to control and be independent. Oh and she loves solving the mystery pieces and collecting her stickers. The FJH Music Company is genius! So with all of this, I should probably have it all figured out for when the twins begin their lessons. Right? Well I do know that I will be taking it slow, and praying for God’s guidance. Learning to read music and play the piano is not an option, but how they go about doing it is up to them. I plan to keep it short, sweet and easy at first. I may try to find a hobby teacher that I can really work with. As I look back, this is the type of teacher that my composer started out with and she is the reason that he never hated playing as much as my ballerina did. His first teacher was fun and easy going. I unfortunately started my ballerina with my composer’s master teacher. He had the agenda to make her a master musician at an early age, but this was not the path God created for her. She knew this and made it clear by her actions, since I would not listen to her words. She was not purposefully defiant, just resisting a mold that she did not fit into. It is not my intent to have master musicians who can play Mozart with perfectly curled fingers while never missing a note by the age of 10. It is my intent, however, that my children become skilled musicians in order to play for the glory of God when he calls them to do so. God will give them joy in their hearts for everything they do for Him, as long as we are obedient to faith. 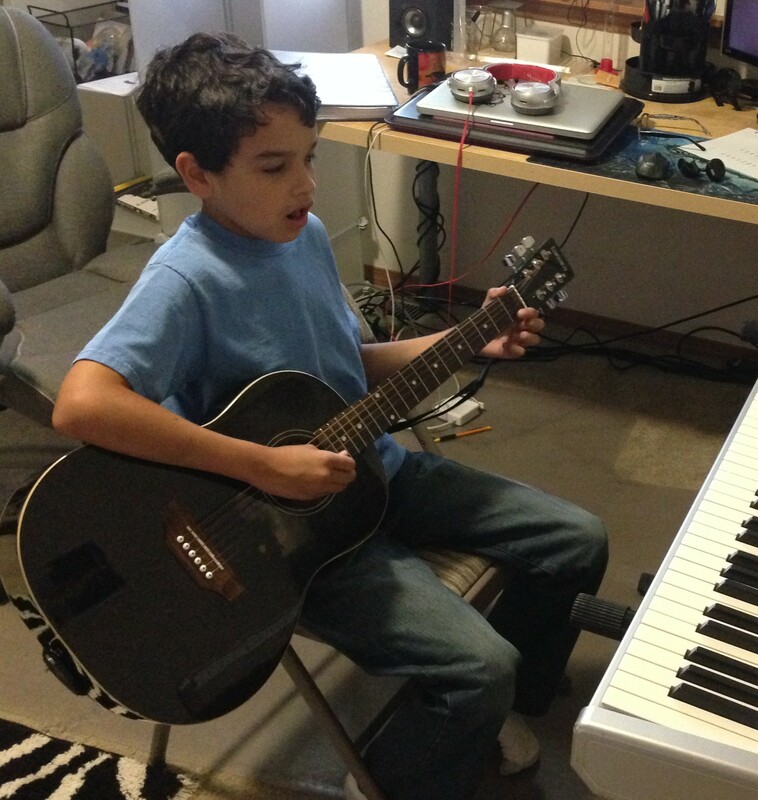 This entry was posted in Homeschool and tagged classical training, guitar lessons, music, piano, piano lessons, worship band. Bookmark the permalink. Unique perspective by Teacher-Mom! Your blog shows self-examining of learning practices that will lead into living a life blessed abundantly. Also, an honest life into home schooling is fun reading! Look forward to next one!